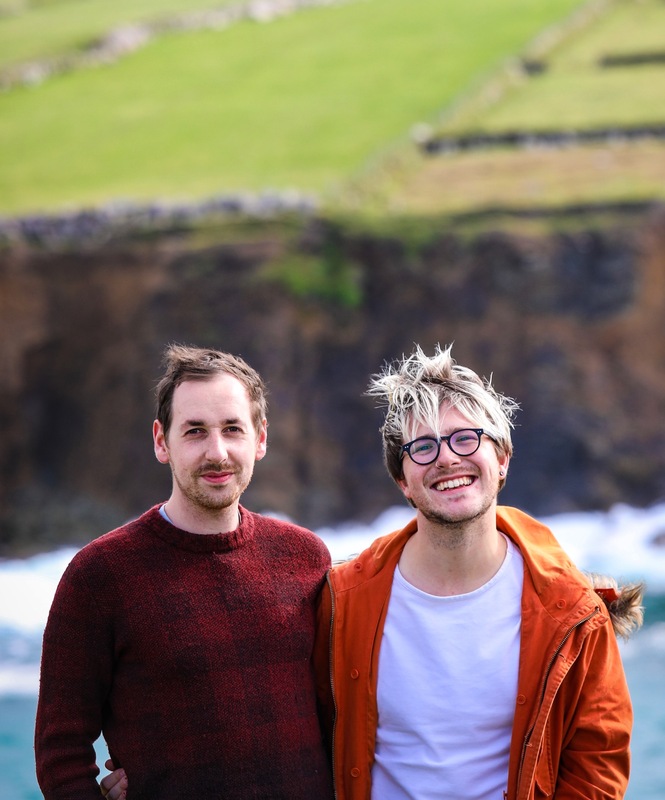 As two recent graduates, the college/uni experience is a recent memory for us both and our three years each of college were formative in broadening both of our horizons in the kitchen and just cookery and food in general. 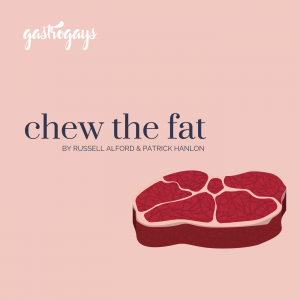 Patrick has a few recipes to guide uni students along the culinary pathway while exercising their brain muscles. Read on below for ideas for student-friendly lunches, dinners and desserts, then click back to our breakfast and snacking post for university students. *A little note – In Ireland, we tend to collectively call third level institutions ‘college’, whereas it seems in the UK it’s collectively known as ‘university’ or ‘uni’, we will use both but throughout the post, but bear in mind it all means the same thing and time of life. Lunch can be a little difficult as it’s the middle of the day and most students are between classes or hovering around campus somewhere. Because lunchtime is not a set time in the college clock, it’s difficult to navigate how to keep fed. You want something that, if you take in from home, will last the morning (and beyond) in case you catch a late lunch, and you also don’t want to rely on cafeteria/canteen/campus shops to constantly feed you as they are rarely healthy and the cost is something that cannot be kept up with. Our advice for lunch? Invest in good, airtight, excellently portable lunchboxes. These will see you through any eventuality in Uni. It’s cost effective and you know exactly what you’re eating. We personally love the Sistema Klip-It range, hailing from New Zealand they are available from retailers in the UK and Ireland like Tesco, Asda and TK Maxx. It’s worth the extra few quid to invest in the best quality available. If anyone has had cold soup or porridge slowly filling up their bag and ruining everything within, you will know how frustrating this is and how worthy an airtight container is as an investment. Salads are pretty obvious for lunchtime, but always experiment. Always try get a balance with your salad, and don’t be confined to working around lettuce or greens. They wilt so easily and get mushy when dressed. Don’t be afraid to also use fruit. Tart fruit like nectarines, apples and pears work so well to offset salty or strong cheese flavours. 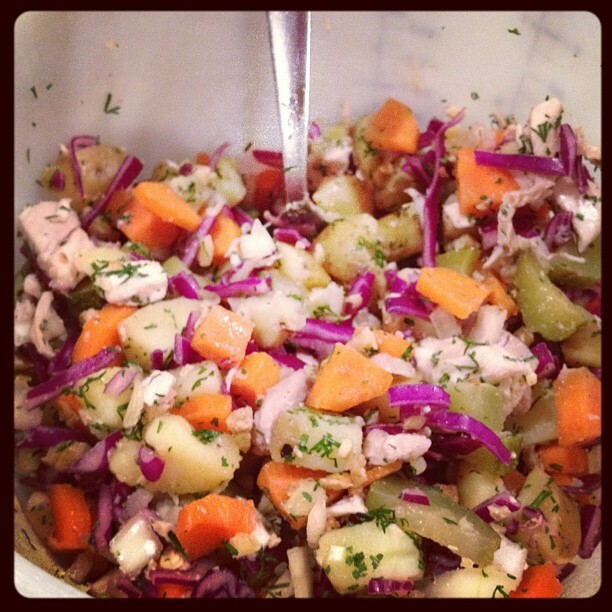 Always rely on the vegetables, after all, the classics of deli counters – potato salad, coleslaw, three bean salad – rely on a vegetable main ingredient and that’s the way they work best. If you want nice meat alongside your salad but can’t be bothered or have no clue how to cook the raw meat in your kitchen, prepare your salad, take it in, and buy a roasted chicken breast or some freshly cut deli ham slices and simply add to your salad to finish. Russian winter salad: This is a great one to make on a Sunday night that will see you right through to mid-week if kept in the fridge and dipped in and out of. It centres around root vegetables with some cupboard additions and a bit of chicken (maybe generously donated trimmings from mum’s roast at the weekend?). 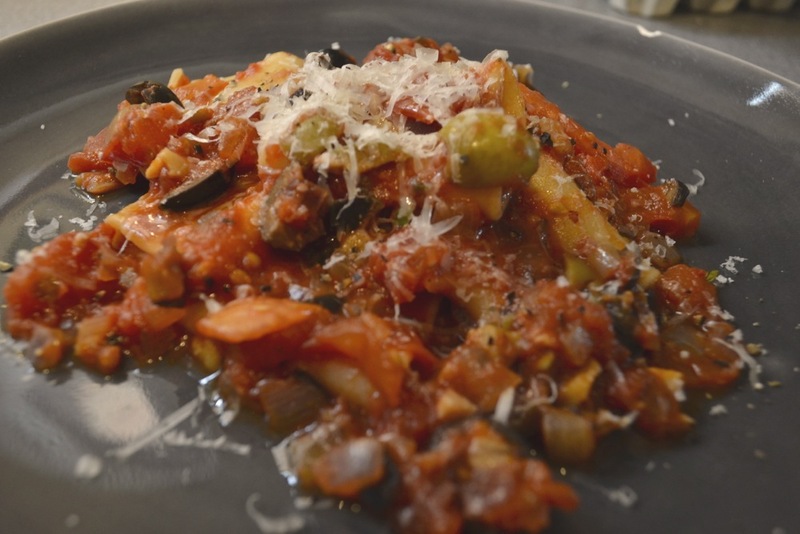 My recipe was inspired and adapated from Monica Loughnan’s one. 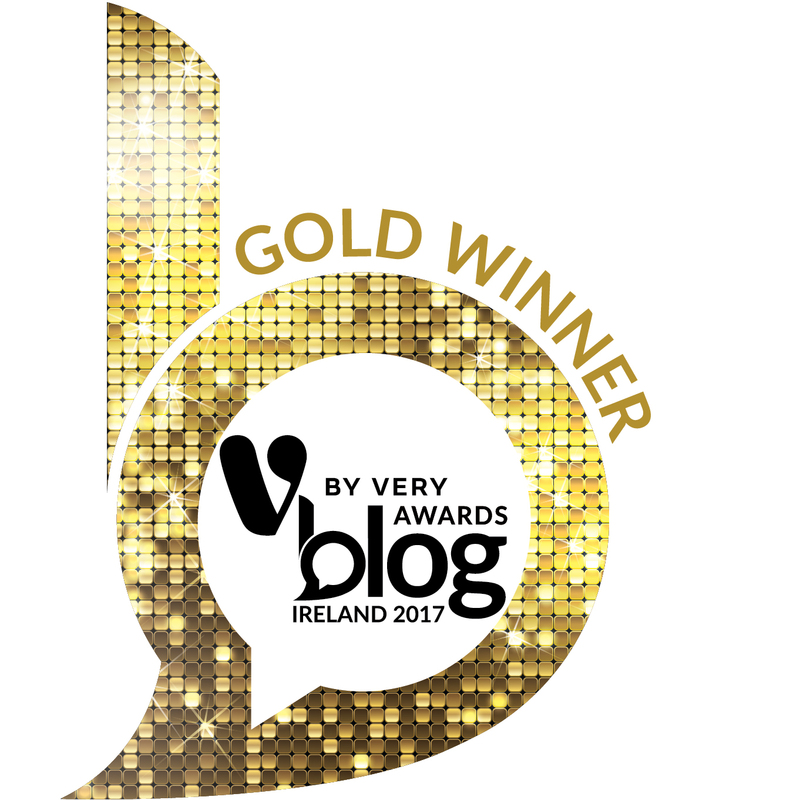 You can find mine published on the RTÉ Food website. Spicy sweetcorn salad: This is an absolute no-brainer. We all have cans of sweetcorn lurking in the cupboard or frozen in a bag at the bottom of the freezer. 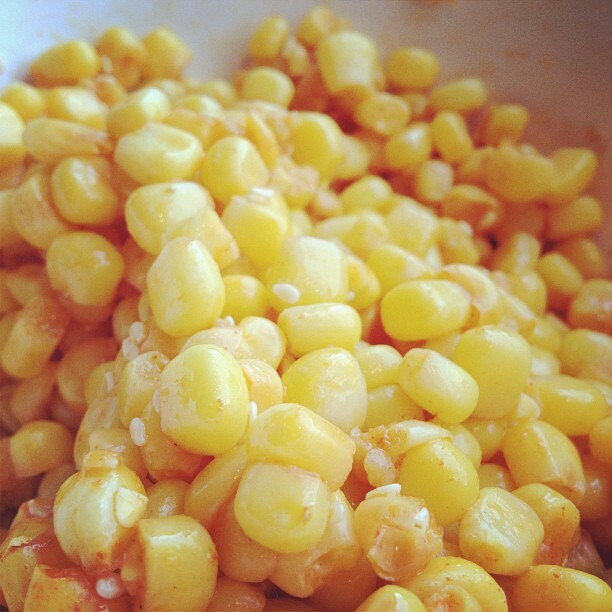 Save for a few feeble outings mixed with tuna or thrown into a stir fry, the humble sweetcorn barely gets used. Yes, granted it doesn’t really provide the system with anything of note other than helping the metabolism flow, but don’t overlook it! Sweetcorn has quite a plain flavour and at it’s best when boiled from frozen until just cooked, then shocked in cold water to keep the colour and stop the cooking process. Dress in a little butter and lemon juice and spice with some paprika, cayenne, mustard powder and a sprinkling of salt. Sprinkle over some roasted, chopped nuts or sesame seeds if you want to add another dimension of texture and crunch. 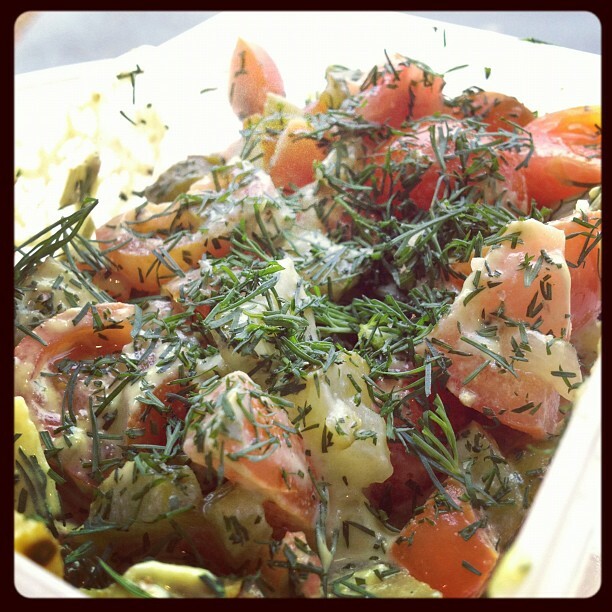 Tomato, dill and pickle salad: This is an acquired taste for those who enjoy the sprightly anise of dill and the briny bite of pickles/gherkins. With a tomato in a salad, you want to scoop out all the juice and pips and dry the walls of the tomato in kitchen paper to avoid the salad swimming all day in watery tomato juice. This is a great way to use up pickles or olives from jars in the cupboard. Simply lump together with some roughly chopped tomatoes, combine with a good fistful of chopped dill (or you could use chive, parsley or coriander) and mix with a a tablespoon or two of creme fraiche and a big dollop of dijon mustard. 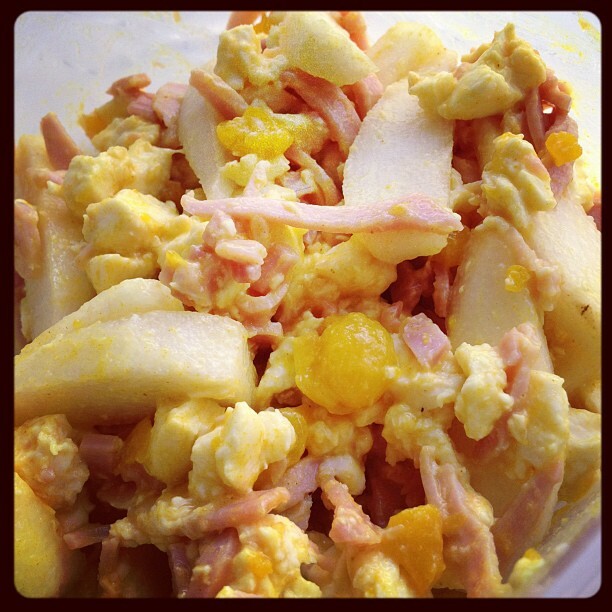 Piccalilli, pear, cheese and ham salad: This is inspired by a Ploughman’s lunch and works really well if you can get your hands on some good deli ham, freshly cooked and cut. The salt of the ham works so well with the sharp, vinegar zing of the piccalilli, the watery crunch of the pear and the creamy, soft mozzarella cheese. You can substitute pear for apple, ham for chicken, piccalilli for mustard or even cheddar for the mozzarella. It’s more the idea of the balance of flavours in this that works rather than specifically what’s in the picture above. A must try, but this doesn’t really sit well for more than a day, so it’s best made the morning of or late the night before. 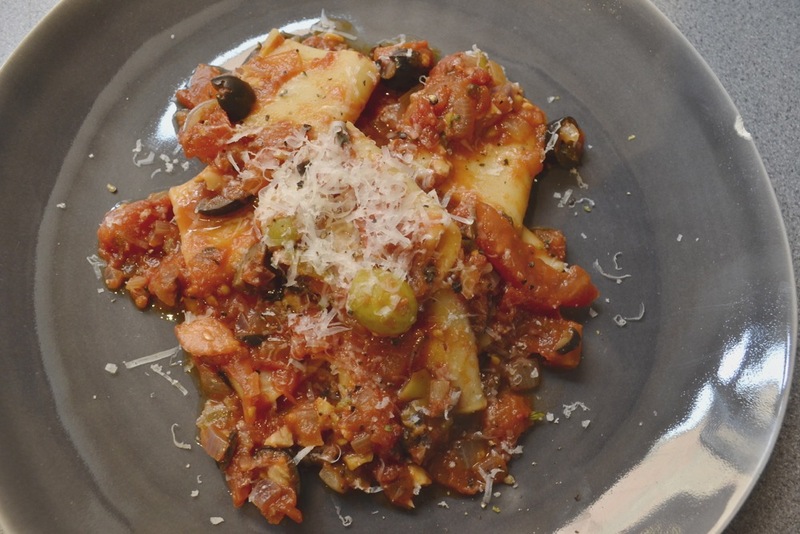 One of the easiest dinner dishes, but the most simply satisfying, is pasta alla puttanesca. Traditionally served with spaghetti, I find it works with any type of pasta really and is far, far superior to any shop-bought tomato sauce. 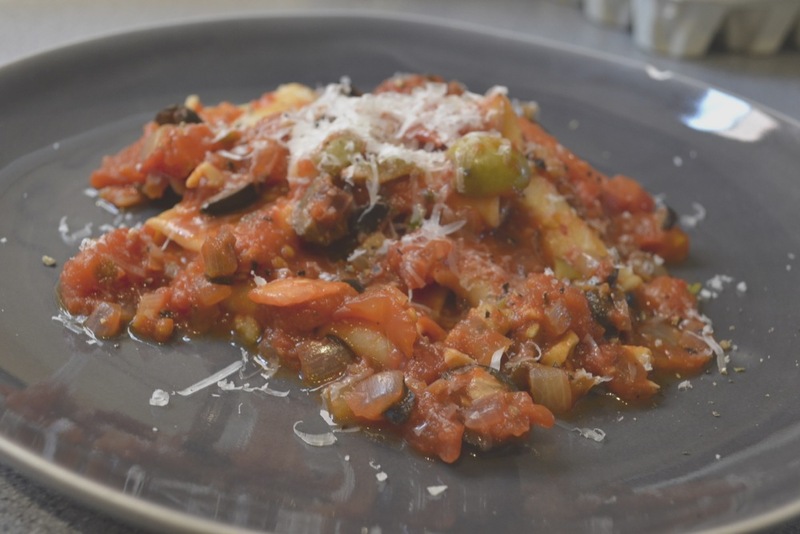 It’s a thick, tomato based sauce, flavoured with olives, garlic and herbs (as well as anchovies, capers and chilli in certain variations). Cooking the sauce from scratch takes merely the same time it takes to cook and slightly cool the pasta and the taste is something a jar or can of sauce can never achieve. The idea is that all the ingredients can come from the cupboard or ingredients that almost every household will have. Cook one portion of your favourite pasta in boiling, salted water, as per the packet instructions. Heat a pan on medium and fry the onion and garlic in a little oil, before adding in some dried oregano – fresh is better if possible, but in a student’s kitchen cupboard it would be lucky to have herbs to choose from, so dried will do just fine here. After everything has softened throw in the chopped olives to warm through before chucking in a can of chopped tomatoes. Season your sauce appropriately with salt and pepper and stir in 1 tbsp of sugar to help balance the acidity of the canned tomato. You can, of course, use fresh tomatoes in this sauce but it requires removing the skins and cooking for a good thirty minutes. Take 4-5 tablespoons of the starchy pasta water and add to the sauce, cranking up the heat to high and let simmer away for a good five to ten minutes to reduce. When the pasta is just turning from under done to perfectly cooked, drain it a colander and throw over a cup of cold water to stop the pasta cooking. In the last minute or so, introduce the pasta into the sauce pan and let the two mingle, before plating up. A sprinkling of chopped parsley and a light grating of a hard cheese over the top to finish would work perfect here, if at your disposal. One of the most simple desserts, actually beyond simple, is crumble. Great in winter, it will cook in under half an hour and is warming, comforting and satisfying. Best yet, it even works with fruit straight from the freezer. For the savvy shopper, keep an eye on yellow label/reduced stickers on fresh berries in your local supermarket. During the colder months, grab a bag of berries from the freezer aisles. With near-date berries, give them a sniff and inspect to ensure they are still just about good to use and take them home. Pour them all out on a small baking sheet or plate and put it into the freezer. 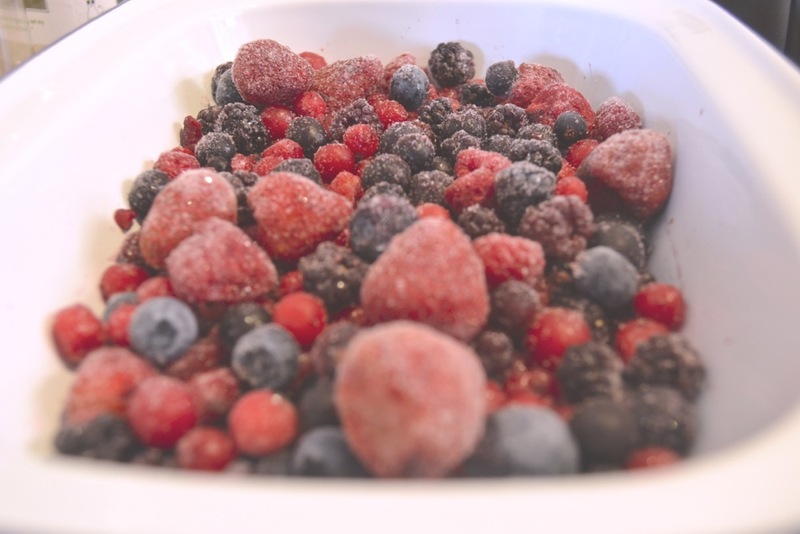 A few hours later, take the frozen berries out and drop into a large freezer bag. Keep frozen until needed to be used. 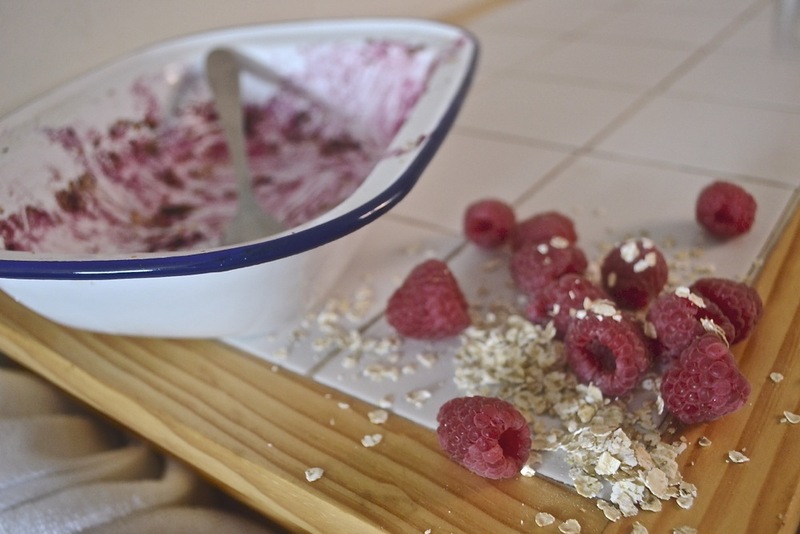 Bung the berries straight from the freezer into a baking dish (or large ramekins if doing individual crumbles). Sprinkle over the cornflour, followed by the caster sugar. The cornflour will soak up the juices and water which will leak from the berries and make a glossy, rich and thick fruit sauce. 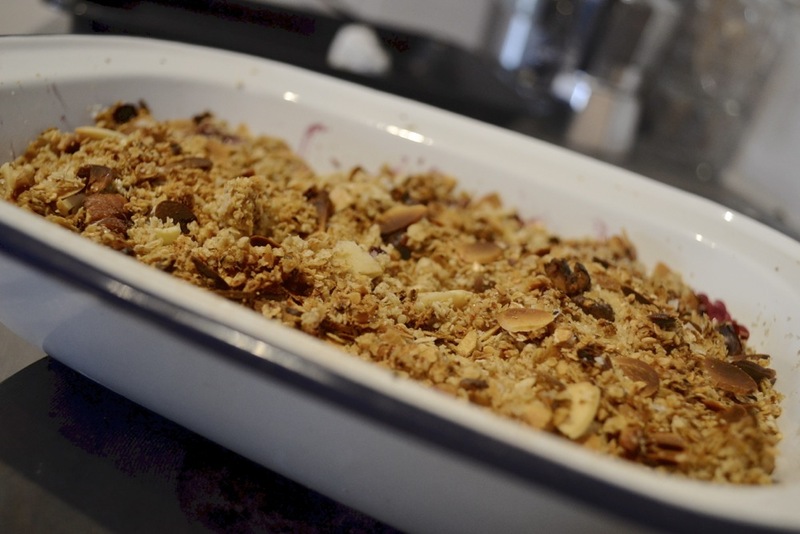 Make the crumble by combining the granola, almonds and demerara sugar. Scatter the crumble on top. Be as liberal or as conservative as you want, as every person’s happy ratio between fruit and crunch is different. 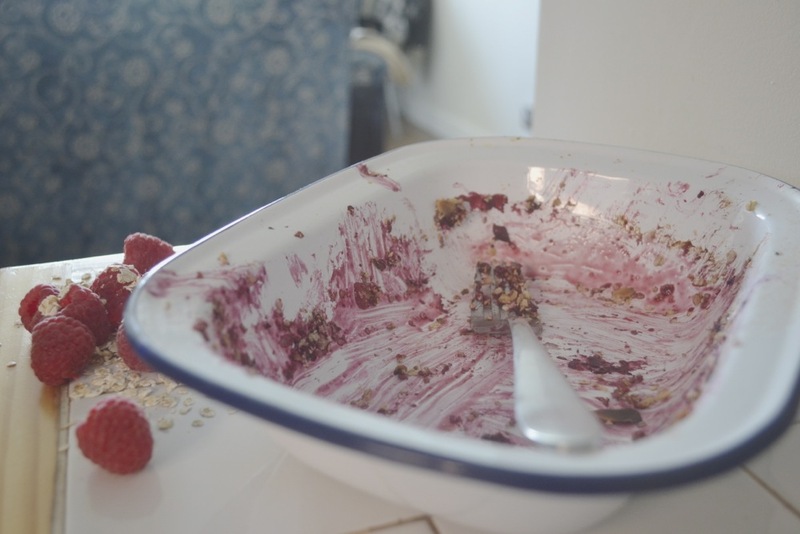 Don’t completely cover every millimetre of the fruit in the topping as one of the most pleasurable sights is seeing the berries ooze and peak out under the browned topping. For a shiny, golden crumb, now dot small cubes of butter atop the crunchy topping in various places. Bake for around 30-40 minutes, keeping an eye in the last quarter on the browning of the topping. Serve straight from the oven with a dollop of cream or even ice cream. Personally we like a bit of crème fraîche to cut through the sweetness of the berries and sweetened, crunchy topping. I like my berries tart and not super sweetened, so if you like them sweet as pie, up the sugar ante in the recipe. 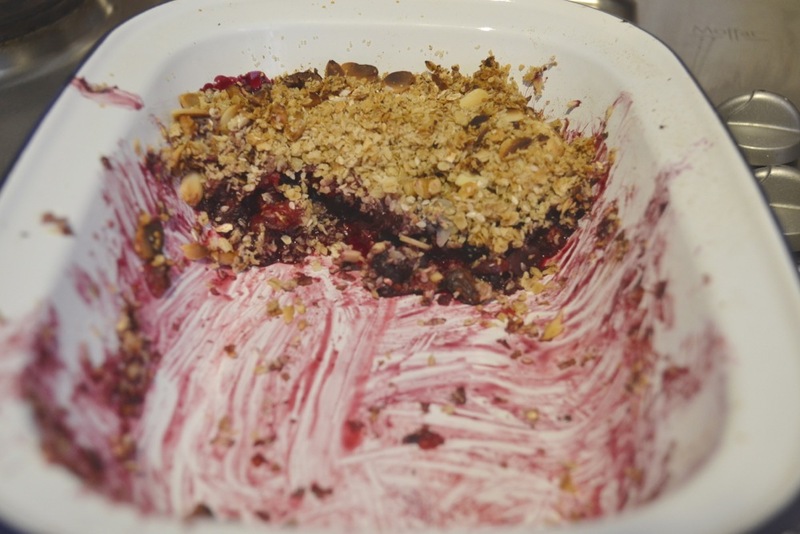 You can easily make your own crumble using butter, flour and sugar (with a little bit of oats and nuts too if you like) but granola works just as well and cuts out that step if looking for a quick dessert at uni.